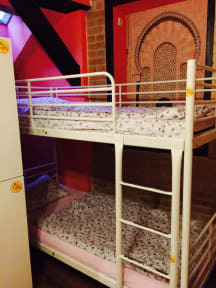 Backpacker Hostel i Prag, Tjekkiet: Reservér nu! We arrived on our first day in Prague to an empty hostel with no one around. When we tried calling the linked number no one answered. Check in was at 3 p.m. but the receptionist didn't arrive until 4 p.m. Not very clean, and bed bugs in several rooms. The service was not very good, the receptionist was never there, and when they were there they wouldn't help with anything. The gate was supposed to be locked at night but wasn't. There were no air condition even though it said that there were.